Clark Atlanta President Ronald A. Johnson and Morehouse School of Medicine President and Dean Valerie Montgomery Rice provide compelling insights on how a strong American workforce needs the creativity and brain trust developed by historically Black colleges and universities. 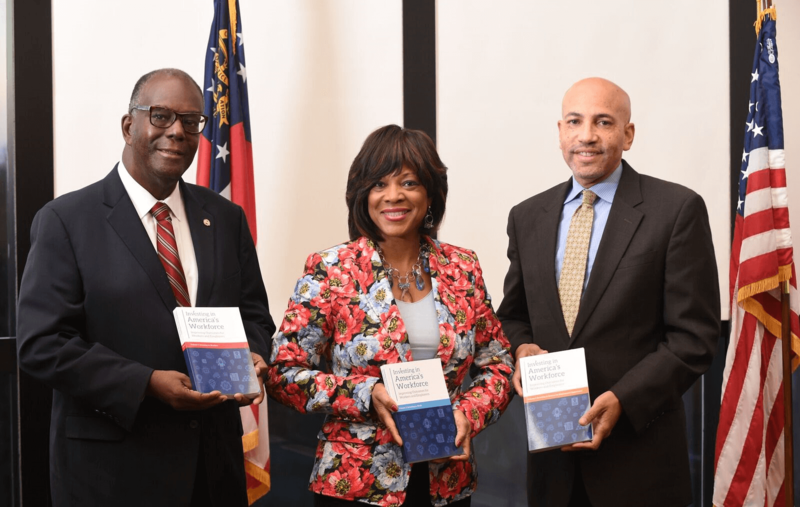 Pictured left to right are Ronald A. Johnson, president, Clark Atlanta University; Valerie Montgomery Rice, president Morehouse School of Medicine; and Todd Greene, executive director of the Atlanta University Center Consortium Inc.
(ATLANTA – Nov. 20, 2018) In a new Federal Reserve System-led book, “Investing in America’s Workforce: Improving Outcomes for Workers and Employers,” Clark Atlanta University President Ron A. Johnson and Morehouse School of Medicine President and Dean Valerie Montgomery Rice detail strong evidence about the importance and relevance of HBCUs in the workforce development process. From pipeline to career, they argue that HBCUs are uniquely situated to respond to employer needs and to prepare graduates for long-term success. Johnson’s essay, Pipelines for Diversified Intellect, Creativity and Innovation not only details the historic contribution of HBCUs in creating strong leaders across corporate America and in other employment contexts, he also cites evidence of how HBCU graduates perform better in the labor market where they have been uniquely prepared with high levels of skills and confidence. In Promoting the Health of Communities for Long-Term Benefits, Montgomery Rice (joined by Morehouse School of Medicine Vice President David Hefner), address workforce development pipeline by describing an innovative program linking MSM students and faculty to K-5 STEM education. Because of their strong traditional ties to marginalized and disinvested communities, HBCUs are well positioned to both positively impact pipelines to college and employment and to contribute to the long-term overall economic performance of these communities. “Investing in America’s Workforce,” a nearly 1,100-page collaborative book, brings together more than 100 national thought leaders and subject-expert authors and editors to explore the systemic barriers to employment and the strategies and investments to help overcome those barriers. Pictured with Greene is David Hefner, MSM vice president for Strategy and Institutional Effectiveness. 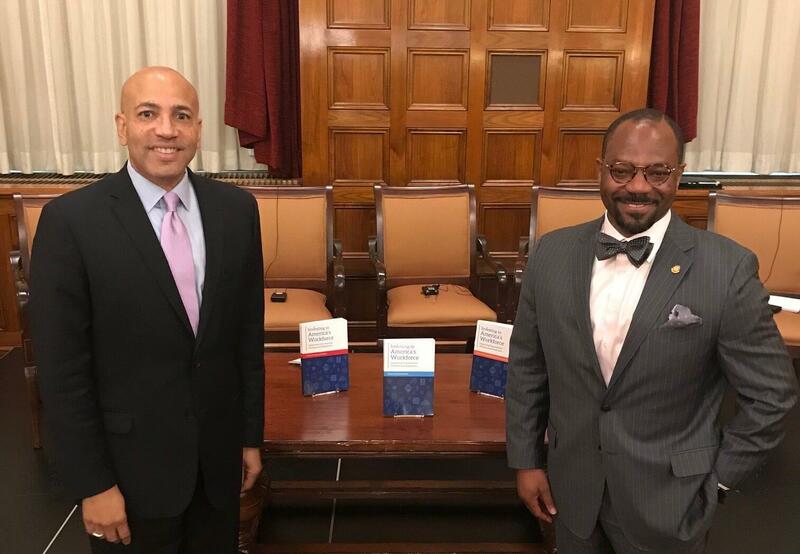 The three-volume call-to-action is the result of a two-and-a-half-year collaboration between the Federal Reserve System, the John J. Heldrich Center for Workforce Development at Rutgers University, the Ray Marshall Center at the University of Texas at Austin, and the W.E. Upjohn Institute for Employment Research. The book offers approaches for improving the human capital of America’s labor force, expanding access to jobs, and innovating workforce development funding. Johnson and Montgomery Rice’s essays are framed by an introduction – “The Critical Role of Historically Black Colleges and Universities in Workforce Development” penned by Atlanta University Center Consortium Executive Director Todd Greene. Yet another important contribution in this section is from former Morehouse College president and current Harvard University administrator John Silvanus Wilson. He suggests that workforce-related investments in HBCUs should be directed to institutions best positioned for achieving the strongest outcomes. Further, in his essay, HBCUs as Pipelines for Diversified Intellect, Creativity and Innovation, Wilson shares that strong endowments, the ability to undertake successful capital campaigns, and maintaining effective governance structures are critical components for HBCUs effectively preparing their graduates for the workplace. “Investing in America’s Workforce: Improving Outcomes for Workers and Employers,” can be downloaded from www.investinwork.org/book, or request a hard copy by reaching emailing Ashley Bozarth at Ashley.Bozarth@atl.frb.org.